This is from my 2019 calender either the April or the October page. 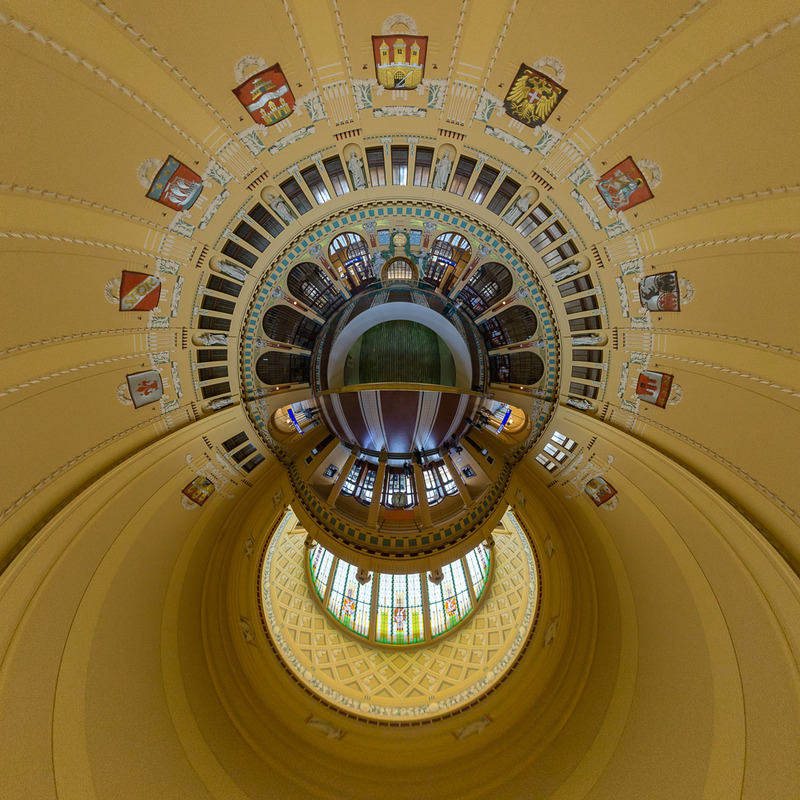 This stereogrpahic reprojection was generated from a spherical panorama I took in the center of the entrance dome of Prague’s main station. See the interactive version on Google Maps. This spherical panorama was taken right below the Eiffel Tower in Paris. This panrama was taken at the Re:Start Mall in Christchurch. This spherical panorama was taken from under an art sculpture in the courtyard of the ADAC headquarters in Munich. This image was taken inside the shopping area of Melbourne Central. The central feature is Coop's Shot Tower under it's conical glass roof. The tower is registered as a heritage building in the Victorian Heritage Register. I think this panorama is not one of my most spectacular ones, however I took the image because I was thinking about a reprojection of the scene. Originally this panorama was my submission to the World Wide Panaorama event 'Decade'. I took it with a monopod mounted on a tripod and took four images with the Walimex 8mm fishe exe lens mounted on the Sony ILCE-7.